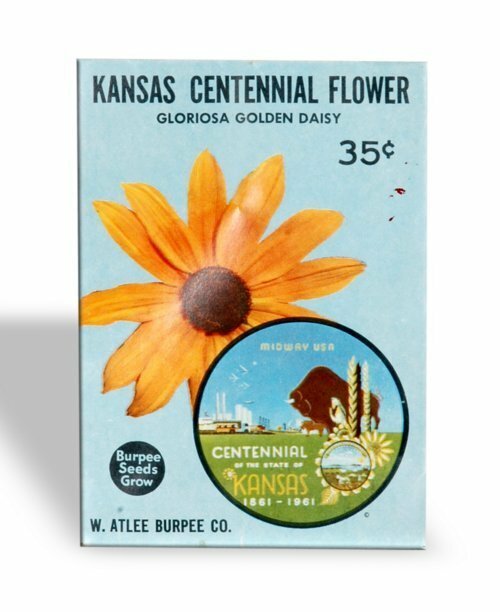 Kansas Centennial daisy seed packet. The packet contains daisy seed, a plant that resembles the sunflower, the Kansas flower. Burpee, a Philadelphia-based seed company founded by W. Atlee Burpee in 1876, produced the packet for the 1961 Kansas Centennial. The Kansas Centennial Distributors Incoporated, a corporation created for distributing and selling items for the Kansas Centennial, licensed the seed packet.